With Halloween here, it means that GET YOUR GHOUL ON! MONTH is officially over and I wanted to say thanks for all of the wonderful comments and feedback you've shared throughout October. It really means a lot to know that the ideas and projects you see here actually inspire you. On that note, I have to give a shout out to two AFOMFT readers, and my lovely friends, Kyla and Tamlyn who threw a Boo! Bash using some inspiration they got here with results that were beyond spooktacular. Just look at this spread! The food looked frighteningly fabulous. And the details were creepy and cute! It's no surprise that all of the little ghouls and goblins had so much fun! Thanks to Kyla and Tamlyn for sharing their scary soiree, and if you've thrown a party or done a project inspired by something you've seen on AFOMFT, we want to see! E-mail us pictures and details at afomft@gmail.com. Since this post was all about saying thanks, what better way to show my gratitude than with a giveaway? And fittingly, it's for a set of 16 Thank You Cards from Pear Tree Greetings. 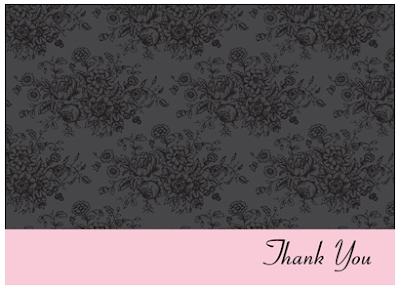 They have wonderful notes to express your appreciation for any occasion. I want to get these for Gabrielle and Alaina to send out after the holidays. 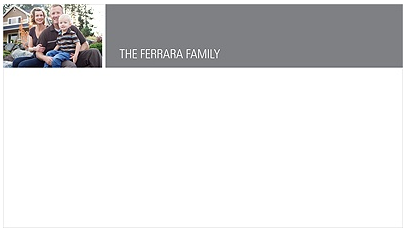 This design is great for the entire family. And these are perfect just for me! Visit Pear Tree Greetings and post a comment telling me which Thank You Notes you'll choose if you win. Please leave a separate comment for each entry (two if you've blogged about the giveaway) and make sure to include a link to your tweet, blog post, etc. All entries must be posted on AFOMFT as a direct comment to this post. Comments on Facebook will not count as entries. This giveaway is open to residents of the U.S. and Canada and ends November 5th at 11:59 pm EST. The winner will be selected by random.org and announced on AFOMFT on November 6th. If the winners don't contact AFOMFT within 48 hours, a new drawing will be held so be sure to check back to see if you've won! CRAFTASTIC: Get Your Glitter On! 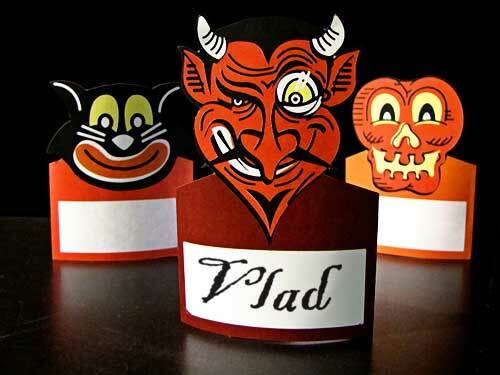 With the big day less than 24 hours away, I have one last Halloween-themed craft project to share with you. And this one is a doozy! No, your eyes aren't deceiving you! That is one sparkly pumpkin. Don't you love it? Lucky for all of us, Kristy from Posh Pixels Design Studio has the full how to for how to glam up your gourds. I think that I'm going to glitter some up for the holidays. Wouldn't they make fabulous centerpieces? Speaking of the holidays, starting Monday, AFOMFT's HOLIDAY HAPPENING will be kicking off! It's a whole month filled with great gift ideas, creative crafts and party planning tips for the perfect holiday celebration. We've had such an overwhelming response from people wanting to participate that we'll be posting several different features each day so if you have a product you think AFOMFT readers would appreciate or would like to do a guest post on crafting, cooking or party planning, e-mail me at afomft@gmail.com. After all, this time of year, the more the merrier! Oh, and did I mention we'll be holding at least one giveaway a day? That's right - you don't want to miss it! Just two days until Halloween! Are you ready? Here are two simple projects from Martha Stewart to make sure you are. What are your kids going to use to collect all of their loot? 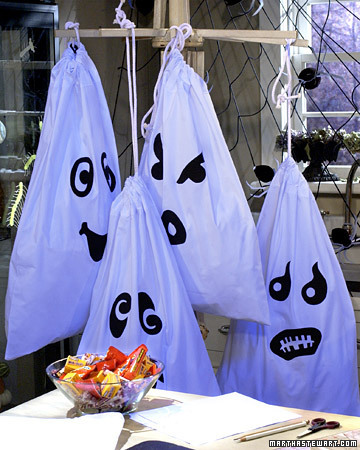 If your answer is "Ummmm....." give these Pillowcase Trick or Treat Bags a try. They're easy to make and you can make them even easier by skipping the closure and using a Black Sharpie to draw the faces on. And if your trick-or-treaters will be hitting the streets Sunday night, you're going to want to send them off with a few of these Flashy Lights. 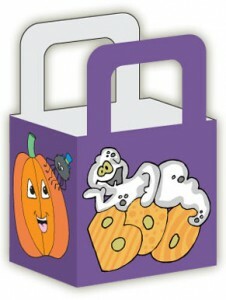 They're even simpler to make than the treat bags and your kids won't complain about being safe with something that fun! I can't believe GET YOUR GHOUL ON! MONTH is almost over! It's been so much fun featuring lots of Halloween goodies. The only thing that can alleviate my sadness is a fabulous freebie. Or nine! Dress up your chocolate with printable candy wrappers from Lil Boo and Co.
Top off your treat bags in terrifying style with bag toppers from seven thirty three. And treat boxes at Woo! 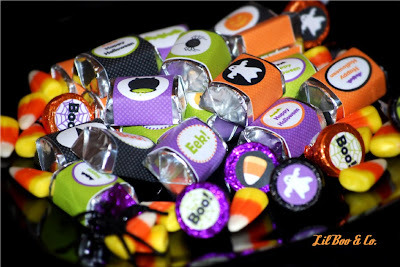 Jr.
Trillustrations has the perfect solution for making for non-candy treats - bubble wrap labels! 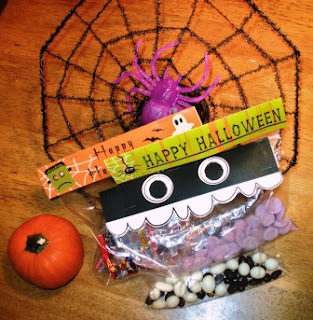 And Leelou Blogs has Halloween cards to share. As well as a banner to decorate your doorway. 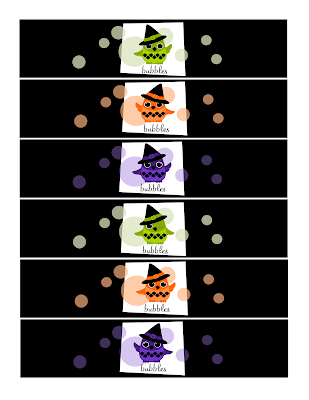 And if you want to give your blog a frightastic facelift, check out their free Halloween backgrounds and layouts. I bookmarked this great Halloween idea from Jacinda at Prudent Baby last year because it's so simple but also completely spooktastic. 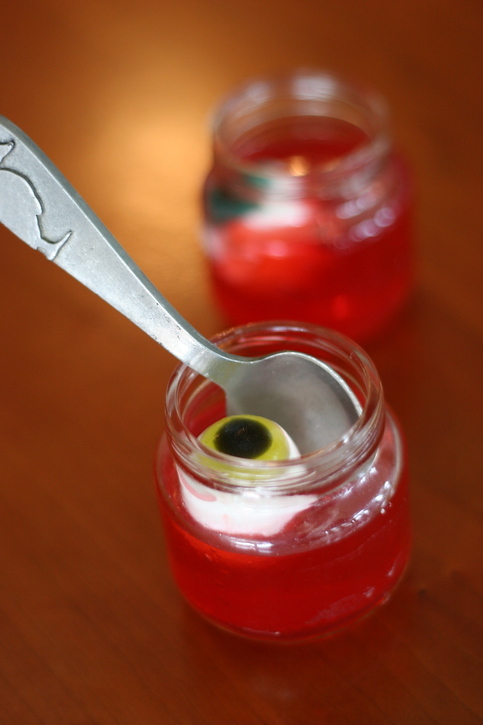 Yup, those eyeballs are suspended in Jello. Frighteningly fabulous, right? You can make them for your kids but Jacinda shares a naughty version for mommy too. Either way, whoever you're serving will certainly get an eyeful! Get the full how to at Prudent Baby. Congratulations GOLDENMAMA! You've won a Martha Stewart Score Board! You can use it for so many fun crafts, like these DIY Milk Cartons. Don't forget to download the template here. Please e-mail me at afomft@gmail.com by end of day Thursday, October 27th to claim your prize. If I do not hear from you by then, a new winner will be chosen. Want a Martha Stewart Score Board of your own? This coupon is good for 40%off one regular priced item at Michaels through Saturday, 10/30. Happy shopping! 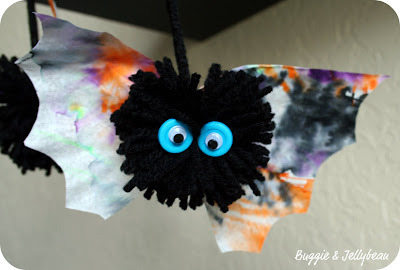 CRAFTASTIC: Gettin' Batty With It! 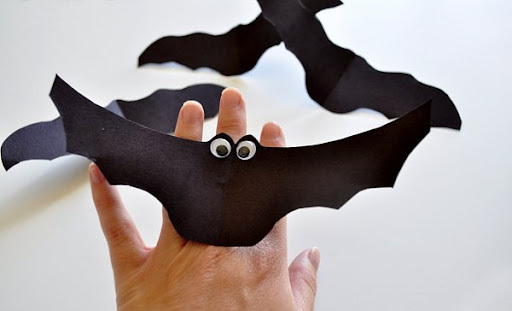 Your little ghoul will love having his or her own Bat Finger Puppets! 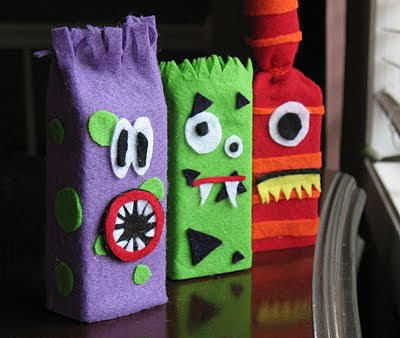 Such a fun way to keep the monsters busy at your Halloween party or just around the house. For the full how to, visit The Mother Huddle. One of my favorite party inspiration sites is One Charming Party and the recent posts Brittany has been sharing around Halloween celebrations are to die for! You'll find everything you need to throw the ultimate Boo Bash! I adore Brittany's fun food ideas. And the candy centerpiece is beyond fabulous. 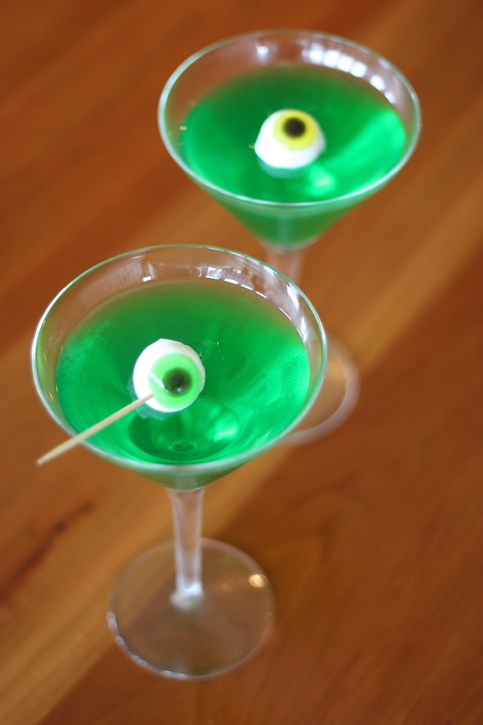 Head on over to One Charming Party for more Halloween fun! And there's now a One Charming Party Facebook Page too so you can be sure you won't miss any updates. Like the page and let them know that A FEW OF MY FAVORITE THINGS sent you! 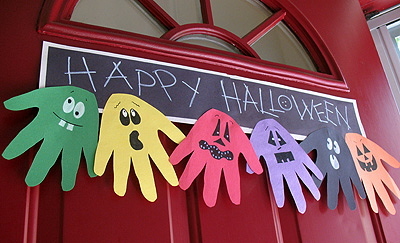 With Halloween only 10 days away, I figured sharing 10 frighteningly fun craft projects was in order! Get the how to for this ribbon and ric rac Boo Wreath at Create. Buggie and Jellybean shows you how to make Silly Bats with coffee filters. And Crafts by Amanda has Halloween projects galore! I love her Juice Box Monsters. The Handprint Ghoul Banner is great for getting the whole family involved. 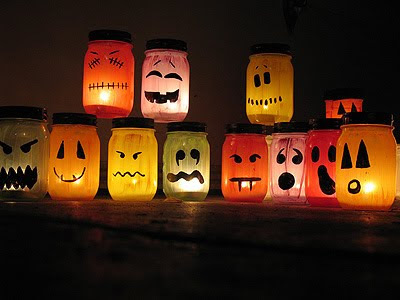 And the Painted Jack-O-Lantern Luminaries will keep monsters at bay. Gingerbread Snowflakes has a simple tutorial for Tabletop Ghosts. 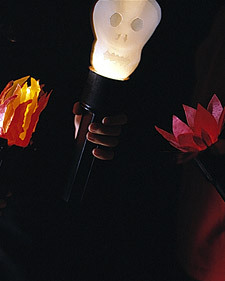 You can even make them glow-in-the-dark! 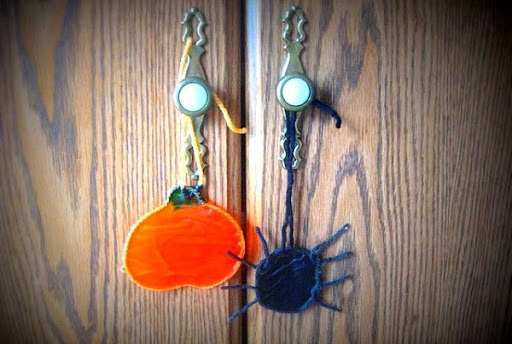 For an easy craft to make with your kids, try these Halloween Ornaments from The Mother Huddle. And last but not least, all of your little ghouls will want a Spooky Eyeball Bracelet! Get the instructions from Amy of Living Locurto at Family Fun. Can You Spare a Click? CRAFTASTIC: Fast & Easy DIY Treats! Get Spooked at CSN Stores! It's a Party with Martha! 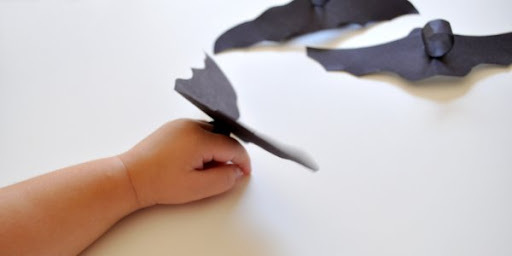 CRAFTASTIC: Ghosts and Skeletons and Bats, Oh My!